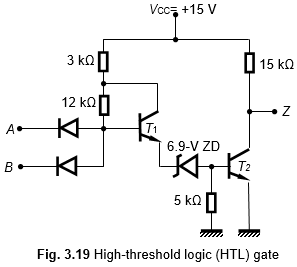 Figure 3.19 shows the circuit configuration of logic gate called high-threshold logic (HTL) gate. The circuit shown in Fig. 3.19 can be employed in environments where noise-interference level is high. This circuit is actually a modified version of the DTL gate with a supply voltage of +15 V, which is very high compared to the TTL supply voltage of +5 V. For the HTL gate, a 6.9-V Zener diode is used as the coupling element between transistors T1 and T2. T1 and T2 perform the NOT operation. Since the coupling Zener diode has a typical breakdown value of 6.9 V, noise of amplitude greater than 7 V alone will be able to produce a switching transition of the gate. These high-amplitude noise voltages are rare and hence the circuit will safely operate in noise-environments. At present, HTL logic gates are replaced with NMOS and CMOS gates, which have, higher noise margins and much more packing density than HTL gates. Hence these gates are almost obsolete.